Unfortunately, early in the week the uncertain track of Hurricane Joaquin forced us to cancel the event in an abundance of caution and concern for our entrants, guests and sponsors. We will be back in the Spring of 2016. Thanks to all for your support. 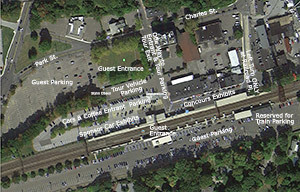 Concours entrant parking will be in the train station parking lot immediately adjacent to the train station off Franklin Street. Entrants should come to the intersection of Franklin and Charles, Westport Police and volunteers will assist you in gaining access to the parking area. Franklin is normally one way away form the station, but for our event it will be open for entrants to access the parking. Guest parking will be in the commuter parking lots for Metro North - one located on Park Avenue on the North side of the train tracks and the other on Ferry Lane, on the South side of the tracks. (See the site layout below). Our tour departs at approximately 11:00AM. Area restaurants will be open for coffee, etc. and lunch or brunch during and after the event. Throughout the event, HANRadio will broadcast live over their internet radio and video broadcasting capability. The event is an informal gathering of car enthusiasts, where proud drivers congregate to kick tires, enjoy relaxed conversation with other enthusiasts and have a cup of coffee. We invite area owners with classic cars, domestic & European sports cars or cars from the 40's and 50's and those interested in viewing beautiful vehicles and talking with their owners, to join us Sunday morning. We also invite area marque clubs to attend as a group. If you let us know that you are coming, we will provide a club parking area for your club members. When you decide to attend the event, you will have the opportunity to register for our tour and lunch following the event. Rich & Jean Taylor always come up with an interesting route through lower Fairfield County. And, enjoy a lunch prepared for us at the Redding Roadhouse. Entry to the parking area for owners is via Franklin Street from Charles St. This street is normally one way away from the train station. For our event, Westport Police will be at the intersection to direct entrant traffic to the parking lot next to the train station and guest traffic to the parking lots. The Featured Exhibit of our October 4, 2015 “pop-up” Concours d’Caffeine will be an exhibit of cars of the 20's and 30's. We have sent out invitations to people who brought vehicles of that vintage to the Fairfield County Concours d'Elegance over the years. Our objective is to have approximately ten vehicles from each decade with a mix of open and closed. If you have a vehicle of that vintage that you are interested in submitting for our consideration, please email us with a front 3/4 profile photo. We will notify individuals whose vehicles have been selected for the Concours via email in early September. When the Concours has concluded at approximately 11:00am, those owners who have registered for our Sunday tour will depart, following a route designed by Rich and Jean Taylor of Vintage Rallies, Inc. of Sharon, CT., to our intermediate stop and then to our lunch stop. Participants in the tour will receive a commemorative license plate and a gift bag from Hagerty Insurance and other sponsors. The fee for the tour, license plate and lunch is $50 for car and two people. Additional lunch vouchers may be purchased for $20 per person. A registrant's desk will be setup at the parking lot for Tour participants to pickup their license plate, gift bag and sign the tour release.